Black Lake Association working to study water quality. The Black Lake Association (BLA) has contracted with the Tip of the Mitt Watershed Council (TOTMWC) to perform Aquatic Vegetation and Shoreline Surveys. The Aquatic Vegetation Study will identify types of weed growth, and the TOTMWC will provide recommendations for control of any invasive weeds found. The Shoreline Survey will document physical shoreline conditions and other factors that may be affecting water quality. Examples of parameters that are commonly documented in shoreline surveys include shoreline type (seawalls, natural, etc., shoreline erosion, presence of cladophora (filmentous green algae that serves as a bio-indicator of nutrient pollution, green belts, fisheries habitat information, and more. The Michigan Department of Natural Resources started a project in 2001 to obtain much needed information about the states fisheries. In 2005, Black Lake (Cheboygan and Presque Isle Counties) will be surveyed as part of the project. The main objective of the project is to estimate population size, annual sport harvest, growth rates, population age structure, and movement dynamics of walleye and northern pike. In addition, we collect information on various other fish species present. Our tagging survey effort takes place in the early spring and consists of intensive netting and electrofishing operations. We attempt to capture, tag, and release about 10% of the legal-size walleye (=15"), northern pike (=24"), muskellunge (=42"), and occasionally smallmouth bass (=14") in a lake. We then track recoveries of tagged fish with a year-long creel survey and by voluntary tag returns. We also collect spine, fin ray, and scales samples to determine fish ages. In addition to the spring survey, we will be conducting a summer survey for a variety of physical and biological indicators. The Black Lake Watershed is large, encompassing 547 square miles or 350,000 acres. It comprises 37.7 percent of the 1,461-square-mile Cheboygan River Watershed. Black Lake's Watershed is 35.04 times larger than the surface area of the Lake (a ratio of 35.04:1, or simply 35.04). This is fairly high for large lakes in Northern Michigan. For example, the watershed-to-surface area ratio for Burt Lake is 14.8 and for Mullett Lake, only 9. Several rivers and streams flow into Black Lake. The major tributaries to the Lake are the Upper Black River (57 river miles) and the Rainy River (24 river miles). Additionally two major rivers flow into the Upper Black and indirectly into Black Lake: Canada Creek and the East Branch (21 river miles each). Other important tributaries include Tomahawk Creek, Milligan Creek, Stony Creek, and Mud Creek. Numerous smaller streams also flow into Black Lake and its tributary rivers. The Watershed contains mostly forested and open space, much of which is state land. Although there are significant amounts of agriculture, it comprises a relatively small percentage of the entire Watershed. There are minimal amounts of urban areas mostly contained in several small communities and strips of residential development along roads and shorelines. The Pigeon River Country State Forest encompasses about 120 square miles, much of which is in the Black Lake Watershed. It is the largest contiguous block of state-owned land in Michigan's Lower Peninsula. The area is managed separately from other state forest lands in the area. Because of the unique features within the forest (Michigan's only elk herd, numerous high quality rivers and lakes, and the wilderness atmosphere of the area), more protective land and water management policies are in place than on most state forest lands. Black Lake is one of the largest and most strikingly beautiful lakes in the Tip of the Mitt Watershed Council service area. 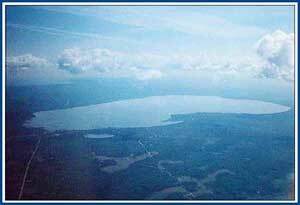 In fact, in terms of surface area, Black Lake at over 10,000 acres is the 9th largest inland lake in the State of Michigan. It is located in the northeast corner of the Lower Peninsula; in both Cheboygan and Presque Isle Counties. The lake's shoreline measures approximately 19 miles and depth maps show the deepest point, about 50 feet, in the southwest section of the lake. Although not pronounced, there are two distinguishable basins in Black Lake; the northwest end characterized by broad shallow areas that deepen gradually while the southeast end is much deeper, wider and has a more pronounced drop-off, particularly on the western side. The largest inlet to Black Lake is the Black River, flowing in on the west side, just north of Five-mile Point. The next largest tributary is the Rainy River, which enters in the southeast corner of the lake. Several smaller streams, including Stony, Stewart, and Fisher Creeks in the south, Mud Creek in the west and Cain's Creek to the north, also flow into Black Lake. These rivers and streams deliver great quantities of dark tannin-stained waters that give the lake its name. Tannins are natural, coming from plants, and do not pose a threat to water quality. The only outlet from the lake is the Lower Black River, which empties out of the northwestern corner. The Black Lake watershed is quite large, encompassing more than 350,000 acres of land and water. The watershed to lake area ratio is 34:1, meaning that there are 34 acres of land in the watershed for each acre of Black Lake water surface. Compared to other lakes in Michigan, this ratio is quite high and indicates that the large size of the Black Lake watershed provides a protective buffer for lake water quality; i.e., it would require considerable landscape development (in terms of area) to negatively impact water quality. Land cover statistics from the year 2000, obtained from the Coastal Great Lakes Land Cover, show the watershed to be relatively pristine with a very small percentage of land cover classified as urban or agriculture (~4%). The Tip of the Mitt Watershed Council has coordinated water quality monitoring programs on Black Lake for many years. Through the Volunteer Lake Monitoring program, volunteers have monitored water clarity, algae abundance and water temperature throughout each summer since 1987. Watershed Council staff also began monitoring the lake in 1987 as part of the Comprehensive Water Quality Monitoring program, resulting in the collection of supplemental data including nutrients, chloride, dissolved oxygen and pH. Data collected in these programs indicates that water quality remains quite high. In addition to water quality monitoring endeavors, the Watershed Council has collaborated extensively with the Black Lake Association and other stakeholders/partners in the watershed to develop a watershed management plan and perform additional surveys. In 2002, the Nonpoint Source Pollution Management Plan was completed as part of the Black Lake Watershed Stewardship to protect and improve water quality by addressing nonpoint source pollution concerns. In 2005, the Black Lake Association contracted the Watershed Council to perform an aquatic plant survey and a shoreline nutrient pollution survey. Through collaborative efforts, the Watershed Council, Black Lake Association, and other partners are making progress in our mutual goal of protecting and improving the waters of Black Lake and its tributaries for generations to come.